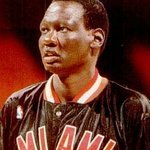 Former NBA player Manute Bol had a vision before his untimely death last year: the 7-foot-7 Sudanese native had a goal to build schools across his native South Sudan. And this week, Bol’s vision got some serious love from the NBA. According to the Kansas City Star, representatives from Sudan Sunrise, the Lenexa-based nonprofit organization that worked with Bol to fulfill mission work in his homeland, met with NBA executives in the league’s New York offices. Tom Prichard, the executive director of Sudan Sunrise said the league has pledged to help raise worldwide awareness and money for Bol’s mission. The NBA plans to help in three ways. First, there will be an NBA TV-produced video about the mission in Sudan that will be uploaded on the NBA Cares web page with links sending viewers to the Sudan Sunrise site. The league will also publicize the school-building effort through social media, and get current players involved, and finally, the league has plans to help the Sunrise’s fundraising efforts by donating items to be auctioned. Prichard also said the league will probably give Sudan Sunrise a grant this summer. Sudan Sunrise, a not-for-profit, non- denominational organization, is a movement of Americans, Sudanese and others to facilitate reconciliation and solidarity between Southern Sudanese Christians, Darfurian Muslims and all Sudanese. Sudan Sunrise also facilitates efforts of Southern Sudanese in Southern Sudan to provide education, health care and community development. NBA Cares is the league’s social responsibility initiative that builds on the NBA’s long tradition of addressing important social issues in the United States and around the world.